Emissions trading brings the rules of the marketplace to environmental regulation. For example, a government trying to control acid rain might set a limit of ten metric tons on emissions of sulfur dioxide SO 2 (which causes acid rain) in a particular year. If there are 1,000 electric utilities, it might give each utility 10,000 "allowances," each of which allows the utility to emit one ton of emissions during that year. In such a timeframe, if one dirty utility is able to reduce its emissions to 8,000 tons of SO 2 , that utility can sell its 2,000 excess allowances to another cleaner utility that is quickly growing and for whom it might be prohibitively expensive to further reduce emissions because its operations were already quite clean. Both would benefit from this trade because the allowance value will be higher than what it cost the dirty utility to reduce emissions, but lower than what it would have cost the clean utility to achieve them. During the same twelve months the utilities would monitor their emissions; at the end of year they would be required to prove to the government that they had emitted fewer tons than they have allowances for. Total emissions are limited to ten metric tons but some flexibility exists in regard to which utilities actually reduce emissions. The kind of approach outlined in this hypothetical example makes it cheaper to achieve the target and may lead to stronger environmental controls in the future. This is a simple system. There are some choices in how it is designed. First, the government does not need to give away the allowances; it could sell them to companies. This allows everyone else to benefit from the system. Second, if it does not matter whether emissions happen this year or next, the allowances could be "banked" for future use. For some pollutants, such as the greenhouse gases that cause climate change, what matters is the total accumulation in the atmosphere, not when or where they were emitted. For other pollutants such as carbon monoxide, which is poisonous at high concentrations but disperses quickly, when and where it is emitted is important. Emissions trading is one of the key "flexibility mechanisms" in the Kyoto Protocol (signed in 1997) that aims to control climate change. In this case, governments jointly agreed on the total emissions cap and then decided how many allowances each country would receive. Countries may trade allowances, but they must monitor their greenhouse gas emissions and submit a report to the United Nations every five years to show that they have as many allowances as emissions. The United States did not sign the Kyoto Protocol. They argued that the U.S. target was too strict and, hence, too costly. They also argued that the agreement would have no value without the participation of developing countries. Emissions trading is particularly useful when there are a lot of different emitters and when companies rather than the government know best how to reduce emissions or improve the technology to reduce emissions. In an emissions trading system, companies will use their knowledge to make the best economic decisions for themselves, while also meeting environmental standards in an efficient way. Emissions trading is not effective when the exact location or method of disposal of the emissions does, in fact, matter (e.g., toxic waste disposal) or when the timing of emissions is critical (e.g., discharging hot water into a river causes substantial damage if a large amount is released all at once, but almost none if it is discharged very slowly). In these situations, environmental standards cannot be met if companies are allowed to trade because any movement or change in the timing of emissions would have significant effects on the environmental outcome. This illustration shows allowance prices up to and during the first three years of the U.S. Acid Rain program which commenced in 1995. Prices first were dispersed and unstable, but once the market became established, they converged. Prices initially fell as utilities identified cheaper opportunities for abatement. markets are well designed, these philosophical concerns seem to decrease with positive experience. Emissions trading is widely used in the United States. Examples include the acid rain program for controlling SO 2 , the RECLAIM market for criteria pollutants in Los Angeles, and the new nitrogen oxides (NO x ) markets on the East Coast. The United Kingdom has introduced a form of carbon dioxide (CO 2 ) emissions trading as part of its effort to comply with the Kyoto Protocol. Many other European countries and the European Community (EC) as a whole are seriously considering carbon dioxide trading within the EC. The graph shows allowance prices up to and during the first three years of the U.S. Acid Rain program, which commenced in 1995. Prices were initially dispersed and unstable, but once the market became established, they converged. 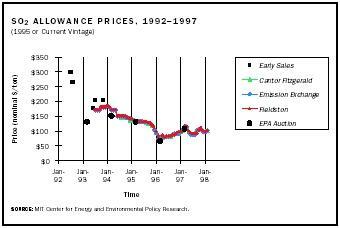 In the beginning, prices fell as utilities identified cheaper opportunities for abatement. SEE ALSO A CID R AIN ; C ARBON D IOXIDE ; E CONOMICS ; I NDUSTRY ; NO X (N ITROGEN O XIDES ) ; O ZONE . Schmalensee, R.P.L. ; Joskow, A.D.; Ellerman, J.P. Montero; and Bailey, E.M. (1998). "An Interim Evaluation of Sulfur Dioxide Emissions Trading." Journal of Economic Perspectives 12(3):53–68. Stavins, Robert N. (1998). "What Have We Learned from the Grand Policy Experiment? Positive and Normative Lessons from SO 2 Allowance Trading." Journal of Economic Perspectives 12(3):69–88. Tietenberg, Tom. (1985). Emissions Trading: An Exercise in Reforming Pollution Policy. Washington, DC: Resources for the Future. Kopp, Raymond, and Toman, Michael. (1998). "International Emissions Trading: A Primer." Available from http://www.weathervane.rff.org/features . U.S. Environmental Protection Agency. "Clean Air Markets." Available from http://www.epa.gov/airmarkets .